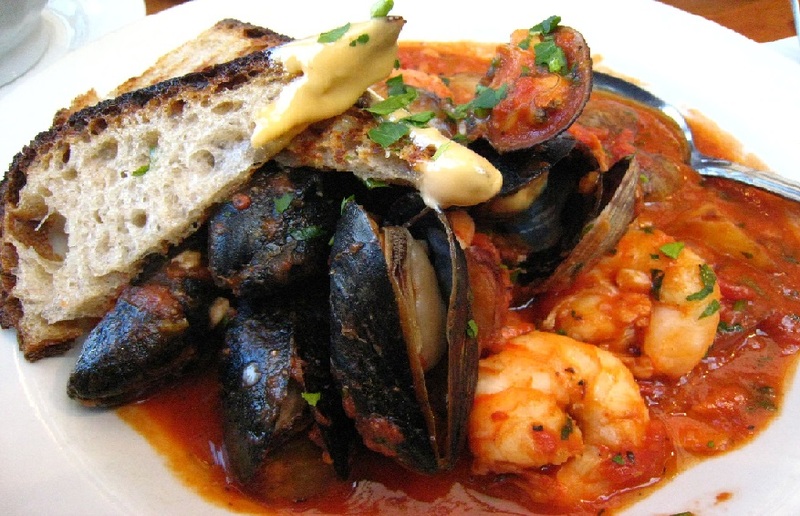 Cacciucco: Cacciucco is an Italian fish stew native to the western coastal towns of Tuscany and Liguria.It is a hearty stew consisting of several different types of fish and shellfish. According to one tradition, there should be five different types of fish in the soup, one for each letter c in cacciucco. A wide variety of Mediterranean fish and shellfish may be used, such as red gurnard, armored gurnard, scorpion fish (scorfano) and small clams such as littleneck or manila, firm-fleshed fish such as monkfish or other whitefish, red snapper, John Dory, or grouper, mussels, shrimp and calamari. Traditionalist chefs add a stone taken from the sea to the dish. Crabs, eels, cuttlefish, octopus, bream, mullet, or anything else caught that day might be used. Toast the tuscan bread slice, rubbed with a garlic clove, till crisp. Season the toasted bread with pepper and keep aside. Wash and clean all the octopus and fishes under clean running water. Heat the olive oil in a large saucepan on medium heat. Fry in the chopped garlic, sage and chilly. Pour in wine and add tomato paste. Cook till the white wine is reduces to half. Add in the roughly chopped octopus and cuttlefish. Add in 1/2 kg of mixed fish. Simmer till the fish is cooked through, takes about 15-20 minutes. Meanwhile, in another saucepan cook all the fish heads in fish stock. Cook till the stock is reduced to half. Blend and puree the fish heads with the reduced stock. Strain the puree through a mesh. Add the strained puree to the saucepan with fish cooking in it. Add in the prawns and shrimp. Add in all the shellfish. Cook for 7-8 minutes until the mussels and clams open up. Season the Cacciuccowith salt and black pepper powder. Cacciucco is ready to be served. Serve the Cacciucco in soup dish by placing the bread slice on the bottom and covering with fish soup.